Bunny Shaming: Daily Shame: What Q-tips? 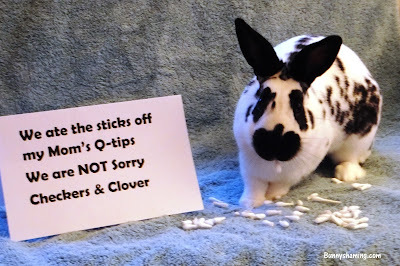 Checkers and his bunwife Clover got to the Q-tips and had a grand time eating all the sticks. At least they were neat - they left all the tips in a pile! And don't worry, their mom kept a close eye on them afterward and re-evaluated the bunny-proofing! My bun keeps trying to eat the cotton on the Q-tips. I keep telling him just because his name is Cotton does not mean he should eat it.